The Outer Banks of North Carolina is a fantastic place to bring your four-legged family member, especially during the off-season months. With plenty of pet-friendly vacation rental homes and overall lenient year-round leash laws, there are many reasons to reconsider a dog sitter and bring your pet with you on vacation. Many towns on the OBX have different leash laws depending on whether or not it's the off season or in season. To clarify the two times of year - the peak tourism or in-season time of year is May 15 - September 15, which would make the off-season September 16 - May 14. Below are a list of dog leash laws broken down by Outer Banks town. If you are going to take your dog to play on the beach, remember to be courteous of other beach goers and ALWAYS clean up after your pet. Many public beach accesses have pet waste removal bags near the access in case you forget to bring your own. During the off-season, dogs are allowed on the beaches of Corolla. Pets must always remain on a leash and no length requirement is mentioned on the town's website. 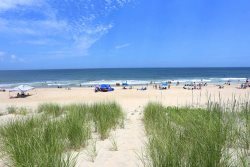 Thanks to the town's lack of public beach accesses, their beaches are typically less crowded than other areas on the Outer Banks. Due to the lack of people, dogs may be unleashed on the area's beaches year-round. Of course, pet owners should always have voice control of their pets at all times. The Town of Duck is definitely one of the most pet-friendly beaches on the Outer Banks. Pet are allowed on the beach during the off-season in Southern Shores. All dogs must be on a leash at all times and under the control and supervision of a handler at all times. No leash length requirement is mentioned on the town's website. During the off-season months, dogs must be restrained on a leash that is no longer than 12 feet in length. Dogs may be taken off the leash if they will not disturb other people on the beach. Unleashed dogs should remain within 30 feet and under control of their handler at all times. Even though your four-legged friend may be running free on the beach without a leash, you must carry a leash on you at all times. Pets are allowed on the beach 24 hours a day when it's the off-season. Dogs must be accompanied and under the control of a owner/handler at all times. You must have your pet on a leash whenever it's on the beach in Kill Devil Hills, no mention of how short and or long the leash must be on the town website. Regardless of the time of year, pets are allowed on the beach at all times as long as they are controlled on a leash - no maximum amount of leash requirement is mentioned on the Town of Nags Head website. Anyone who violates the town's strict year-round leash law, is subject to a criminal and/or civil penalty. When on the beaches of Cape Hatteras National Seashore, dogs must be confined on a six-foot leash at the most. Any pet running freely can be apprehended by park rangers that frequently patrol the beaches daily. All pets are prohibited on designated swimming beaches. All dogs must be confined to a 10-foot maximum length or less leash at all times. The pet owner/handler should be under control of the animal at all times. Pets aren't permitted on the west side of North Carolina Highway 12, apart from areas near and around parking areas.